Environmental and social safeguards are changing for public and private investment in Latin America. At the multilateral level, we are seeing the first major review and update of the safeguard policies of the World Bank (WB) in over a decade, as similar changes are contemplated by Inter-American Bank of Development (IDB), and the evolution of norms continues along with the increasing presence of the Development Bank of Latin-America (CAF). At the same time, the National Bank of Economic and Social Development (BNDES) of Brazil and the Bank of Exports and Imports of China (China ExIm Bank) -two anchors of the recently formed BRICS Bank are both introducing new environmental and social policy or guidance for both domestic and international investments. Finally, sweeping reforms of environmental and social standards are occurring at the national and subnational level across Latin America. To take stock of the effect and direction that these multiple processes of safeguard reform may be having. 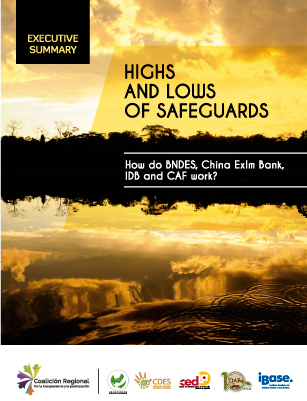 a coalition of civil society organizations have conducted a comparative analysis of the application of environmental and social standards applied by IDB, CAF, BNDES and China ExIm Bank in four emblematic infrastructure projects in the Andean – Amazon region. The study focuses on similarities and differences in how safeguards are applied in the context of the project cycle of several financing institutions. In doing so, the study provides insight into how key decision points in the safeguard process may be the basis for understanding the direction of ongoing harmonization among the social and environmental practices of these institutions.